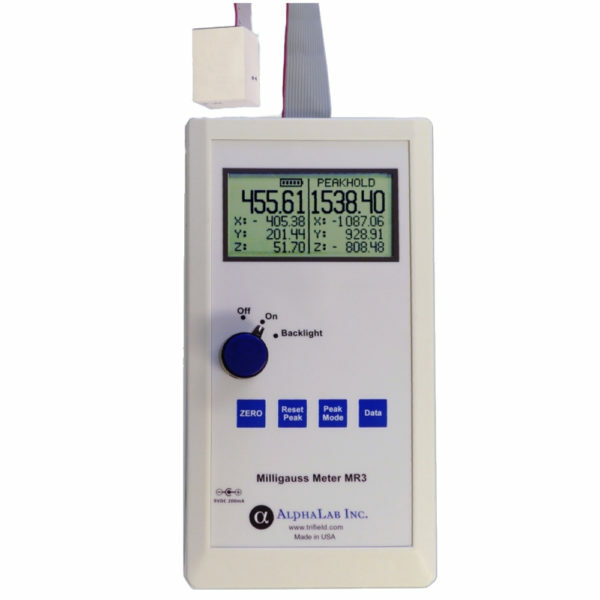 3-Axis Magnetoresistive Milligauss Meter MR3 - AlphaLab, Inc. 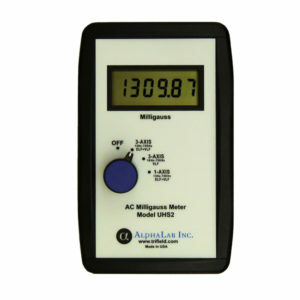 The MR3 Magnetoresistive Milligauss Meter measures and displays the three vector components (X, Y, Z) as well as the magnitude (M) of the static magnetic field. Update is two times per second. The three sensors are in a 25 mm (1”) cube at the end of a flexible 100 cm (40”) cable. It can be powered by 4 AA batteries (included) or a Worldwide AC adapter (included). 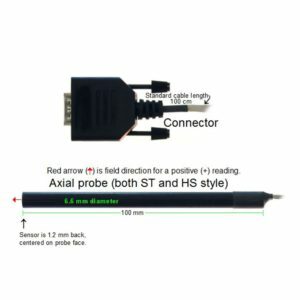 It can collect and store data (X, Y, Z and M) for later download or stream data live via USB connector. Both the instantaneous values of X, Y, Z and M, and their peak values, are displayed on the meter screen. “Peak” values are the highest values seen since the peak reset button was pressed. 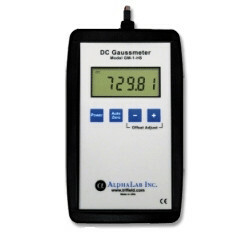 Maximum error of sensitivity is +/- 0.5 % of the reading, and the maximum error of the offset is +/- 0.50 milligauss. Range is +/- 1999.99 milligauss with resolution 0.01 milligauss (or 1 nT) over the full range, displayed simultaneously for X, Y, Z and M. There is a “Zero” button which subtracts the instantaneous field for relative (tare) measurements, if required. The X,Y,Z sensors are about 4 mm below the surface where the red X,Y, and Z are shown on the drawing. Exact position varies about +/-2 mm from that shown, and each MR3 unit has the locations of X,Y,Z manually marked. The arrows in the drawing represent the magnetic sensitivity directions of the corresponding X,Y, or Z sensors. At fixed temperature, reproducibility is +/- 0.01 milligauss (1 nT) and the temperature coefficient of the offset is less than 0.01 milligauss/°C. The temperature coefficient for gain is less than .0015%/°C. Can be used with AlphaApp.